A year ago Hurricane Irma barreled into Everglades City. Everything in this remote southwest Florida fishing village that was not on stilts flooded. Now the town is rebuilding in a state where a policy of climate change denial leaves coastal residents on their own to face the risks. The water outside was chest high by the time Lisa Marteeny flung open the trailer door to flee with her husband Lee and their dog Killer. "It was so loud, and the blowing and the whistling from the wind and everything, we couldn't even hardly hear each other unless we were really close," she said. Water had begun rising through the floorboards of the trailer the couple shared on a canal of the Barron River. Marteeny grabbed the pug mix and waded to a neighbor's house on stilts, Killer doggy-paddling alongside her. Then she returned for her husband, who suffered from heart problems. Together the couple made it safely next door. "You had roofs flying all over the place, and the water rushing in," she said. "A refrigerator went down the street. It was very scary." Wading through the contaminated floodwater would prove fatal for Lee. He died a few days later of infection in his legs. All of these months after Irma, Lisa Marteeny still hasn't been able to go back to her home. She spent the year staying with friends and in a FEMA trailer. She's not the only one. In this tiny town of some 450 year-round residents nearly a quarter are still displaced. "It's kind of sad because there's whole families that are gone that have to live somewhere else," she said. "I think there might be people living in cars, God love them, or they're living in their homes where it's truly not safe." Irma dealt a one-two punch to the state. The hurricane made a first landfall in the Florida Keys and a second in Marco Island. Everglades City bore the brunt of this second landfall when Irma thrust a devastating storm surge into the remote village. But the storm surge could have happened anywhere, and the community's recovery serves as a window into the future for coastal communities across Florida in a warming world. The hurricane was a Category 5 monster with winds topping out at 185 miles an hour. The storm was the most powerful ever recorded in the open Atlantic Ocean. Hurricanes are forecast to grow more destructive with climate change, and no state is more exposed than Florida. Some 84 deaths here are attributed to Irma, and related insurance claims are estimated at nearly $10 billion. "There are a lot of different ways that if we acknowledge these problems now that we can actually save people money, help keep people safer," said Thomas Ruppert, a coastal planning specialist for Florida Sea Grant, a research organization of the University of Florida. "Because the longer we continue to pretend that our coastal areas and the hazards they face are not changing the more we are promoting a future where events will be increasingly catastrophic," he said. Gov. Rick Scott's climate change policy of denial has left the state to focus after disasters on how to build rather than where to build. Scott, a Republican, is running this election year to unseat Democratic Sen. Bill Nelson. He has doubted whether more extreme weather events and rising tides are threats. He's questioned whether human activity is speeding the Earth's warming and banned words like "climate change" from state reports and communications. After touring Irma damage in the Florida Keys the governor said, "Clearly our environment changes all the time, and whether that's cycles we're going through or whether that's man-made I wouldn't be able to tell you." In Everglades City, dozens of homes must be put on stilts under a National Flood Insurance Program rule. The rule requires that if more than half of the structure is damaged all of it must be brought up to current building codes. 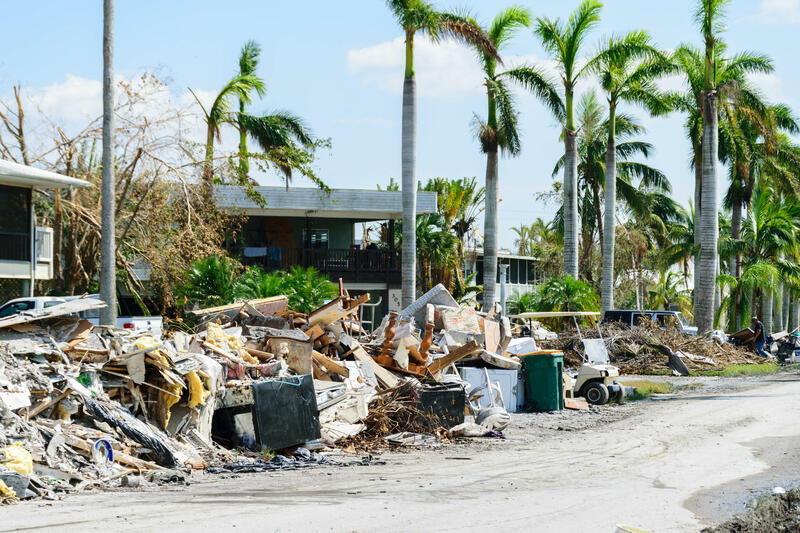 "Ten years down the line I think it's going to be a much more resilient community," said Tony Pernas, an Everglades City resident and chairman of a locally appointed committee overseeing the recovery. "Everyone's going to be up on stilts. There's not going to be this panic the next time a hurricane comes, and we're not going to have to worry about storm surge. The roads will probably be elevated," he said. Mayor Howie Grimm says the community will be better than before. "We've got a lot of new people that want to open new businesses," said Grimm. "We got a guy who wants to open a new hotel, a 40- or 50-room hotel in town." The going has been slow. Some homeowners are awaiting grant and insurance money. Others are having trouble arranging for contractors to make the drive to the remote village. Many hope to see faster progress as more urban areas like Marco Island and Naples get back into shape, and contractors look for work elsewhere. Tina Collins pushes open the door to her mint-colored home and steps inside. "I don't like staying in here very long because I don't want to be exposed to the mold and stuff," she said. It's dark with no electricity. The floor is dirty. The furniture is broken. Collins eyes a wall paneled in Dade County pine. The paneling is faded up to her knees – the height of the flood. "Everything's ruined from that point down," she said. The cottage on the Barron River in the past sheltered presidents Franklin Roosevelt, Harry Truman, Dwight Eisenhower and other VIP guests to this frontier outpost of the southwest Florida wilderness. For Collins, it was home with her husband and high school sweetheart Richard and their three children. Eventually the Collins plan to knock down their cottage where presidents once slept and rebuild on stilts. But they have no idea when they will receive the money from their insurance company. The family has spent the year living in Everglades National Park, paying rent on a ranger's house even while keeping up the mortgage on their shell of a home. Like many here the Collins have considered leaving Everglades City, but this is the only life they know. "My husband is related to a lot of people here, and you know, it just keeps people tightly bound," Collins said. Richard Collins is a fifth-generation resident and a stone crabber in a community that bills itself as the Stone Crab Capital of the World. So, Tina Collins says the family will stay and rebuild. "I'm sure there are a lot of places with people with character and grit, but these families go back generations," she said. Thomas Ruppert of Florida Sea Grant says the reality facing many coastal communities will face is whether they can afford to remain where they are. Already there is evidence the risks of climate change and sea level rise are affecting property values, and that will mean less tax revenue for infrastructure improvements that can address things like more routine flooding. It's possible insurance and mortgage companies will withdraw from coastal areas. "We've typically developed our law and policy on the assumption that the way the world was yesterday is kind of more or less the way the world is going to be tomorrow," Ruppert said. But Ruppert says the world is changing. "What the science tells us about both sea level rise and climate change is that the past is not necessarily a good guide for what is coming down the road in the future," he said. He says acknowledging that reality can help coastal residents understand the risks… and either build differently… or rethink whether to build on the coast at all.